Barbara beatrice Lavitola, founder and CEO of BBLTRANSLATION , reaches every corner of the world and interpreting services wordwide. 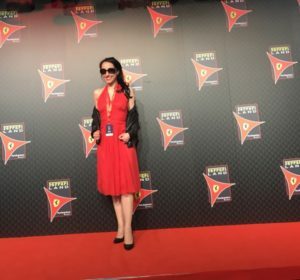 And this time it was not different, barbara was one of the protagonists in the Ferrari Land event in april 2017, with our beautiful red Marilyn dress. A gritty outfit who mixed the femininity and elegance of an ever green dress with a leather stud and black shoes. The must excellence of Made in Italy.